In order to carry out long overdue and necessary repairs to the Millennium House Car Park, St Ive Parish Council intend to seek approval from the Public Works Loans Board for the funding of the works. St Ive Parish Council will continue to undertake cost cutting measures within the daily operation of Millennium House, in order to minimise any adverse effect on the annual Precept for the Budget of 2017/18. Millennium House Coffee Shop Now Open! Today the Millennium House Coffee Shop has opened for business, run by volunteer councillors and members of the public — Marlene Carr, Kathleen Parkes, Ruth Hicks, and Trish Thomas. You’ll find tea, coffee, cakes and friendly surroundings. Additional volunteers are welcome, but the best thing you can do to help out is simply to come along and grab a bite to eat. Show the council that this is a viable solution by making use of it! Thank you to all the volunteers helping to bring life back to this valued part of our community centre, and we hope to see you there. 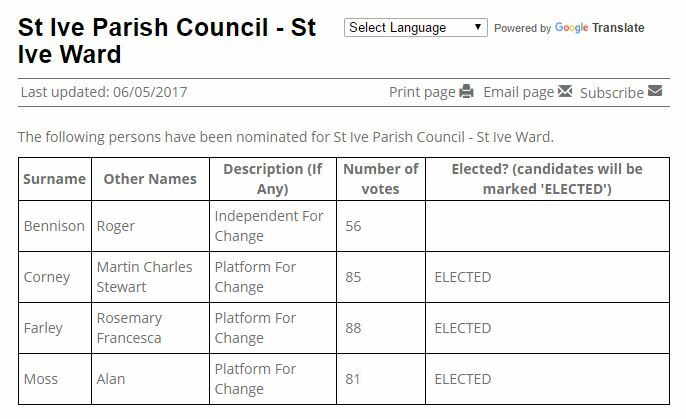 The results of the Parish Council elections for our two wards are as follow. The results of the Cornwall Council elections are in and we have a new Cornwall Councillor for our Lynher Division; Sharon Daw. Many thanks go to our outgoing Cornwall Councillor, Stephanie McWilliam, who has worked hard representing us for the last four years. I am sure you will have heard that at an Extraordinary General Meeting of the parish council on the 28th November, it was decided not to proceed with the transfer of Millennium House to the Pensilva Community Association. I know that those who supported the proposed transfer and gave their time to putting some of preliminary arrangements in place will be disappointed by this decision. Prior to the EGM the parish council sought a legal opinion on the proposed transfer and the subsequent payment of a substantial amount of the parish tax precept to PCA to assist with running Millennium House. The legal opinion was that without certain preconditions having been met, the lease to PCA and the offer of money was extremely likely to be unlawful. In order to demonstrate that the council had obtained good value for money and met the requirement of its own standing orders, it was believed that the parish council should undertake a valuation and public marketing exercise. In effect this would involve inviting tenders from other bidders, this would be both expensive and offer no guarantee that other bidders would have the same community interests as PCA. 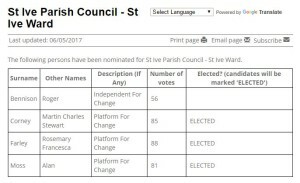 Moreover, it seems very unlikely that this formal process could be completed before the election of a new parish council in May 2017. The parish council believed it would be unwise to enter into an expensive tendering exercise that could extend beyond the life of the present council. In the meantime the income of Millennium House had shown some improvement and hopefully this would continue. The parish council with the help of staff and volunteers will now continue to manage Millennium House and work to improve its financial position. 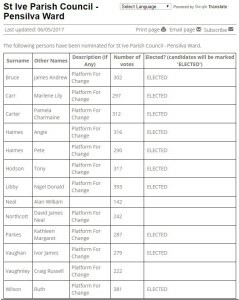 In May a new parish council must be elected, at that time and if they so wish parishioners will have an opportunity to elect a new council with a mandate to pursue a different course of action. 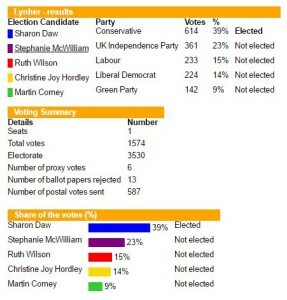 We would urge all those who have an interest in the future of Millennium House to consider standing for election in May. After the EGM of 28th November 2016 from which three Parish Councillors left precipitately, Parish Councillors Peter Dipper, Peter Haimes, Ivor Vaughan and Ruth Wilson have resigned from St Ive Parish Council and Cllr Corney has stepped down from the position of Chair. Because there is less than six months to the next election it is not possible to recruit replacement councillors. 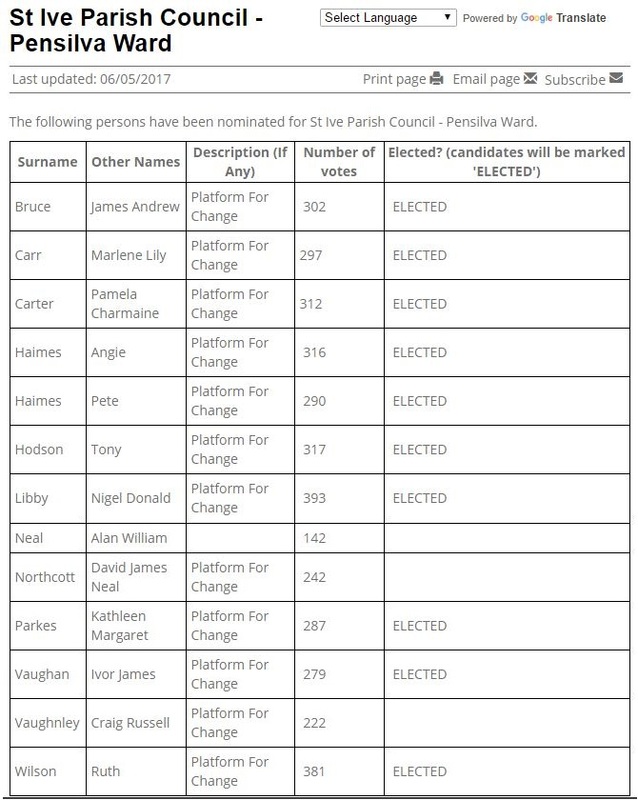 This leaves only five councillors where there should be thirteen. Quethiock Lane, St Ive will be closed from 24th to 28th October 2016 for water infrastructure work. South West Water will be working in the road outside Gorfenna all week. For people who spend most of their time at home, keeping warm in winter (and cool in summer!) is an important part of staying healthy and happy. Community Energy Plus has recently embarked on a new project called Smart Warmth to help vulnerable and low income householders keep warm in their homes so that any health issues are not made worse living in cold or damp conditions. I would be most grateful if you would please promote these grants to your clients in order to help them enjoy warmer, healthier homes. Also see the information about Smart Warmth Grants on the Facebook page (www.Facebook.com/CommunityEnergyPlus) and on twitter (www.twitter.com/CEPCornwall). People may qualify if they live in a low income household which is struggling with its energy bills and a member of their household suffers from a long term health condition. What types of things can be funded? The measures and help available will be dependent on individual need and circumstances and must be for home improvements which cannot be funded by other sources. We can’t fund anything that is the responsibility of a landlord but for more information about what might be eligible, please give them a call. How long is the funding available for? Limited funding is available now and must be spent by October 2016, funding is allocated on a first come first served basis. Pensioners Christmas Lunch: Nominations still open!